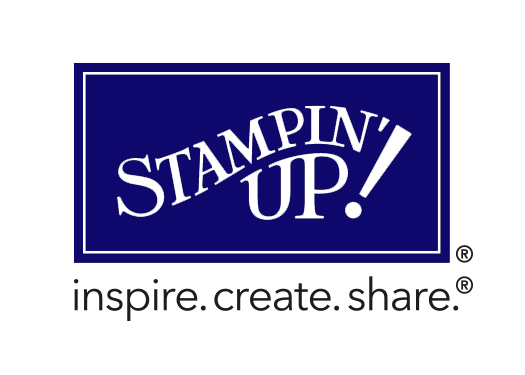 While this is not my first blog post, it is the first since I joined Stampin’ Up. I am excited to be back in the world of paper crafting. This is something I do to relax and unwind. I also get to document my family history and make some really cute gift and ‘thinking of you’ items for friends. I am participating in my first SU Demonstrator Swap next weekend. This is not my usual color palette but I was lucky enough to use inks borrowed from Elizabeth. Cut pieces of Whisper White Cardstock into rectangles measuring 4″ X 5.25″. This is one-fourth of an 8.5 X 11 sheet of cardstock trimmed by 1/4 inch on both the long and short sides. I created the background by applying the three inks (lightest to darkest) using the mini ink blending tool. With the tool, blend the inks together at the borders to allow for a seamless transition. 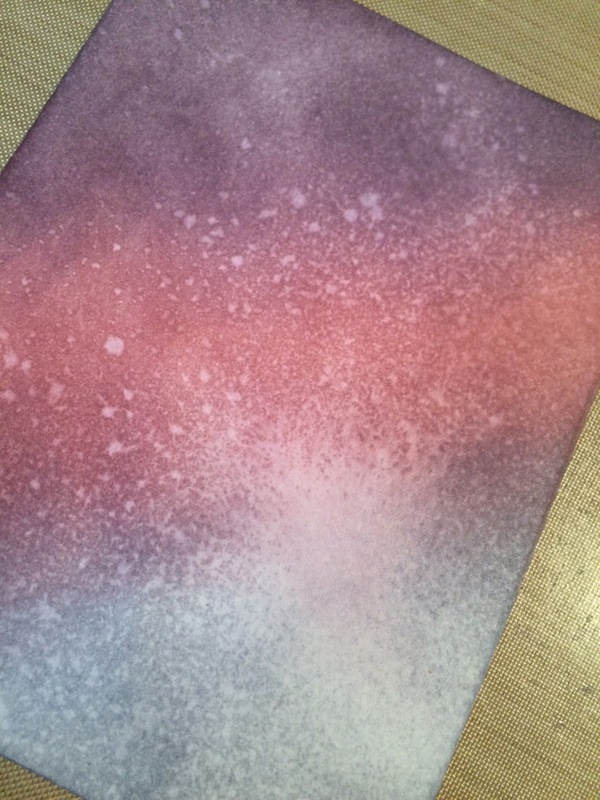 In this sample, I started in the lower right corner with Wisteria Wonder, used Sweet Sugarplum in the center and Perfect Plum in the upper left corner. After making the initial application, take the applicators and blend the colors along the transition area. Next, spritz water from the small spray bottle. Allow the ink to lift slightly. Blot with a paper towel to remove the ink. If desired, remove the pump from the bottle and use the end to flock water drops onto the paper and blot again. Your paper should look like the photo to the left. While the background papers are drying, let’s work on the paper used to make the die cuts on the card. Again, since I have not stocked my supply closet yet with SU products, I am using alternate methods to create colored paper. 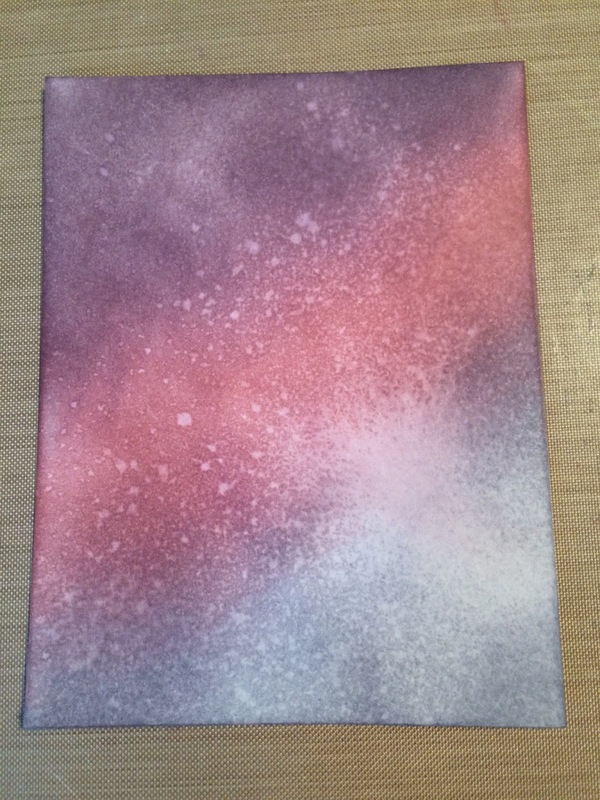 To that end, mist a sheet of Whisper White cardstock. Blot the Wisteria Wonder onto the craft mat. Spritz it with water to create a watercolor type liquid. Using the water brush, apply the Wisteria Wonder ink to the dampened card stock to create a very lightly colored cardstock. After this dries, cut each piece into something small enough to fit through the Big Shot (or Cuttlebug). I cut my sheets in half to make them easier to use. 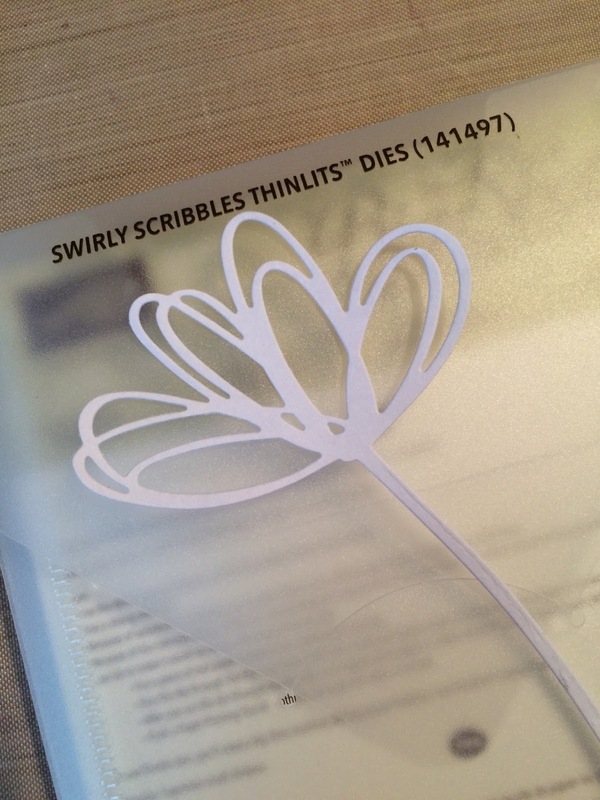 Using the Thinlits, cut one flower and four ‘congrats’. 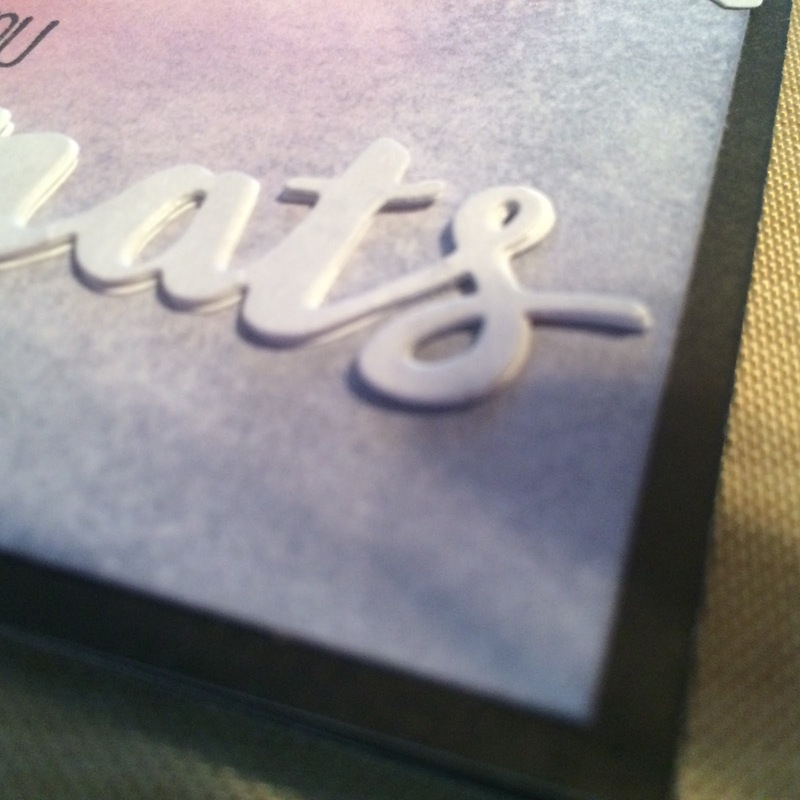 I cut one of the colored cardstock and three of white cardstock. By now, your card background should be dry. It’s time to assemble your card front. Using the Fine Tip Glue Pen apply glue to the back of the flower and place it to the top of the card front at a slight angle. Meanwhile, using the fine tip glue pin again, glue the white ‘congrats’ in a stack and then attach the colored one on the top of the stack (to mimic a chipboard element). That is placed at the bottom of the card and will look like this. Now, we are almost finished. 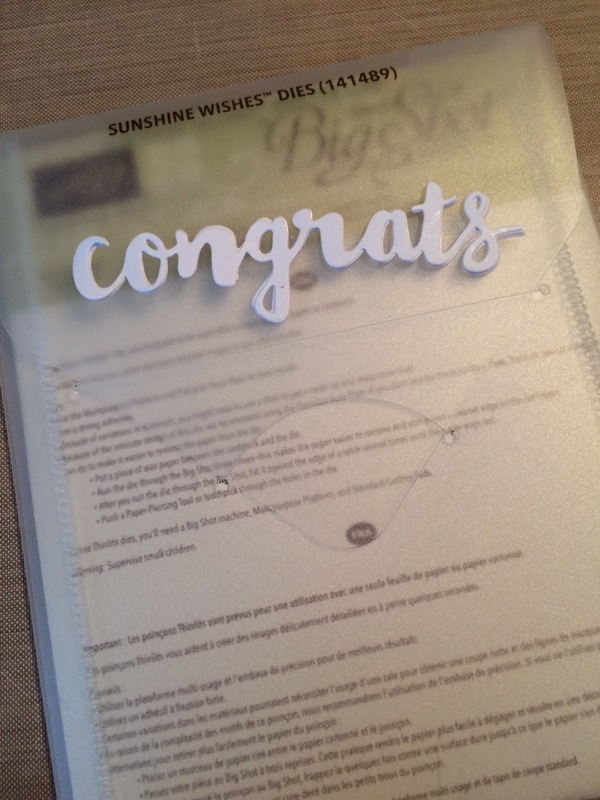 After placing the ‘congrats’ on the card, stamp ‘so happy for you’ just above it to the left. This sentiment is from the Sunshine Saying set. For this color combination, I used Tuxedo Memento Ink. To add a little bling to this card, I added some tiny rhinestones along the stem near the flower. It added just a little dazzle to this card. The final card is a top fold card. I made the base from Black Cardstock. The card front is applied directly to the card base. 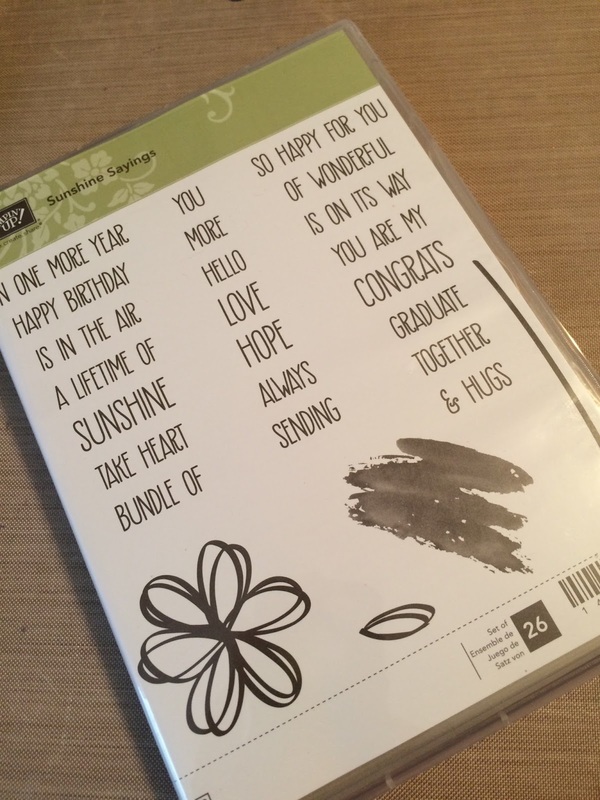 On the inside of the card, add a 4 X 5.25 piece of Whisper White cardstock to complete the card. And, there you have it. A super easy, simple card that looks pretty impressive. This card is amazing so far! Can't wait to see the finished product.